I’m still not sure what category I’d put the Pipesight into. It’s role in life is to let you accurately drill holes for radiator pipework. The idea is that you fit your new radiator and attach the Pipesight to the base of the radiator valves. As if by magic, a laser light now bursts forth and illuminates the floorboards below, showing you exactly where you need to drill the holes in order to connect up your pipework. Do you really need a laser to tell you this? Personally, I use a short piece of copper cut so that it just fits into the valve and touches the floorboard. I then draw around the base of the copper pipe and drill accordingly. It’s all very dull and very low-tech but it also has the virtues of being effect and cheap... but it’s not a laser! And maybe that’s the point? I suspect that the people who will buy this tool will buy it just because it does have the high tech, hint of the James Bond about it. They will be the kind of people who, when confronted by Mr Bond, will scorn the idea of just shooting the bugger and will instead opt for tying him to a bench, aiming a high powered laser at his privates and then departing the scene with a clever witticism. Sadly we all know that this doesn’t work; James Bond will escape, shag the baddies missus and then, when they inevitably meet again, forgo the clever stuff and just shoot the baddie in the head. Is there a moral in this tale? Well if there is I can’t see it. If you like the high tech stuff give the Pipesight a try, after all it is quick and easy to use and the cost isn’t going to break the bank. The laser doesn’t actually burn through the floorboard - which is a crying shame as I’d definitely buy one if it did - but the mark it gives you is going to be more accurate than drawing around a piece of pipe. One of the golden rules of plumbing is “thou shalt not pump mains cold water”. I’ll grant you that it’s not the most exciting of rules but it’s an important one... or at least it was. So what’s happened to consign this rule to the history books? 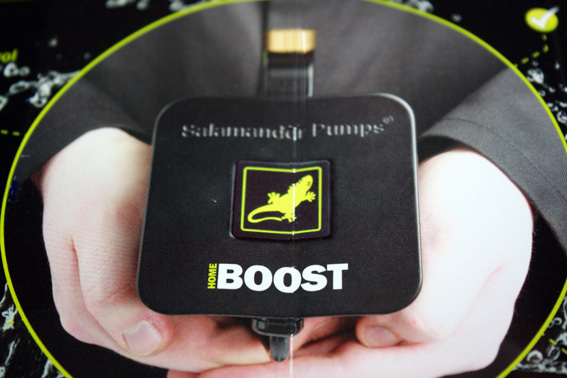 Well Salamander have just brought out the “Homeboost”, a pump specifically designed to overcome poor mains water pressure. So how come this can work on the mains? Well the water regs never actually said you couldn’t pumps mains water, they just added enough caveats to ensure they always put people off the idea. For instance, the pump would have to ensure that it never delivered more than 12 litres of water a minute, regardless of the mains water pressure. It also had to ensure that there could be no backflow of water back into the mains. For some reason it’s taken until now for someone to design a pump that meets these criteria. So why would I want to boost my mains water pressure? Well, if you find yourself asking that question the answer is that you almost certainly don’t need to boost your mains cold water. Most homes in the UK tend to get water entering the house at between 2-3 bar pressure. However, the water supply companies only have to guarantee water to your property boundary at 1bar, which is about 10 litres of water per minute. If the pipe taking this water from your boundary into your home is old and knackered you may well experience water pressure far below this nominal 1 bar. Here in Lincolnshire poor water pressure can be a real problem. Whilst we do have towns and the occasional city the vast majority of Lincolnshire is composed of villages. Some of these could be described as residing in ‘The sticks’, some are most certainly in “The back of beyond” and a few are very much beyond the back of beyond, turn right, cross the ford and take the path signposted ‘Godknowswhere’. News takes its time reaching these places, water can take an absolute age, and by the time is does arrive it’s often under as much pressure as a stoned Hippy lying on a tropical beach. Ordinarily you get around this by pumping stored water but this requires large storage tanks, which isn’t always feasible and won’t help at all if the homeowner wants a nice new shiny combi boiler. And it’s combi boilers that will probably benefit from this new pump the most. So what are the downsides? Well it’s not a cheap pump, with an RRP of £358.80 inc VAT! Apparently it makes less noise than a boiling kettle (46dB) but do you want to hear a kettle boiling all day? And of course it’s going to be using electricity the whole time, so you’ll see an increase in those bills. That said it’s probably still cheaper than the alternatives, which were either large storage tanks and whole-house pumps – more expensive, just as noisy and still using electricity – or digging up your water supply pipe and replacing it with a bigger diameter pipe and hoping that that sorted the problem, which can be very expensive and often doesn’t really work. To be honest if I had low water pressure my only concern would be Salamander themselves. We always found them to make great pumps at a great price but, in our experience, they have a terrible customer support team - we had one customer told she’d have to accompany the Salamander engineer to the ATM so she could pay him, as he wasn’t leaving without payment! Which was bad enough but the bloody pump he’d been called out to look at was faulty. Sadly he was either too incompetent to work this out for himself or under a lot of corporate pressure to earn his keep.... Either way, we ended up with a very upset customer and so we avoid Salamander these days - although we might be tempted to give this pump a try.